For the past ten weeks Amy and I attended an introductory art painting class at the Yard School of Art in Montclair (NJ) Art Museum. Students were given the choice to paint with oil or acrylic paints. Both Amy and I decided to work with acrylic paints mostly due to the easy clean up in comparison to painting with oil. Being a newbie to the official process of painting was challenging and fun. My prior color mixing experience is in the RGB realm of digital art; mixing paint colors is a very abrupt step into a new realm of creating colors. At first I approached mixing color in a very scientific and astute manner. Surprising to me, this proved more frustrating than helpful. Focusing on light / dark value while maintaining a relaxed attitude on hue yielded a more successful result. The first class painting was a still life of various white boxes placed on a table. Building on the rudimentary skills learned in the first painting we painted an autumn still life of an arrangement of gourds. The third, and most challenging painting for me, was a rocking horse. Most students completed their rocking horse painting in three classes while I required four classes to wrap it up. The fourth and final painting was a landscape painting picked by each student. We look forward to attending more classes at the Yard School in the future. Months ago I learned my lottery entry was picked for a bench at the inauguration of the veneer and cabinetmaking course at the JD Lohr School of Woodworking. Filled with excited anticipation I waited for the date to arrive. I’ve now returned from a week of learning and fun with a piece of furniture I am looking forward to completing. I can’t speak highly enough about the instructors: Jeff, Rob, Eoin and Larissa. I honestly consider them treasured friends, if not family. The location of Jeff’s workshop is wonderfully pastoral and scenic, with a scattering of horses, chickens and playful dogs. I’m jealous of the setting each time I visit. Somehow I found a few moments to carve a couple of caricatures as birthday celebration presents. The memories and cabinet will be with me for a long time to come. 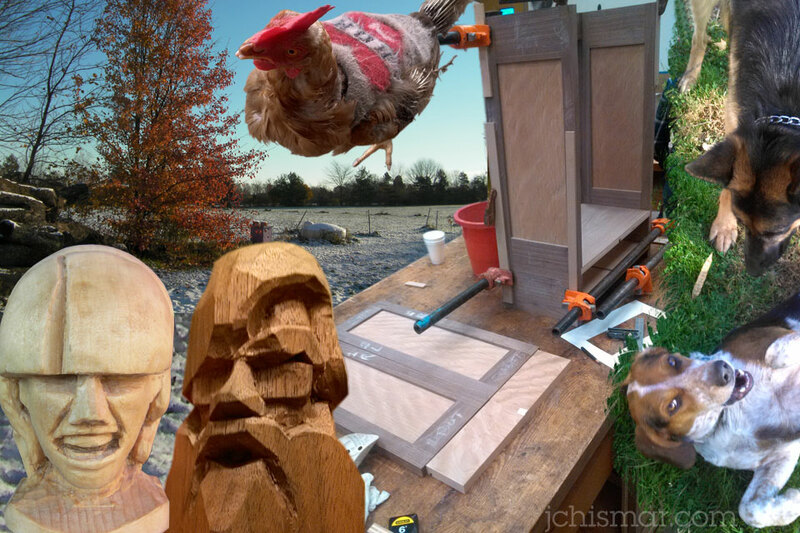 A great time was had this past weekend at the American Woodcarving School with guest artist Vic Hood. The instruction method Vic employs is fun, informative and practical. The three day seminar focused on woodcarving the human head and face. Everything (proportionally) technical to carve a head was clearly explained in six minutes. Vic used the remainder of the three days to tell jokes and reinforce human proportions through demonstration and individual tutoring. For many students, including me, it was the first time carving freshly felled wet wood. My artistic ambitions directed me to carve a female bust (image right); the other students chose to carve men of various backgrounds. The unhurried and supportive environment provided an easy fun feel well suited for long days of carving. Although our carvings were unfinished after three days, each carving was nicely roughed out with important features in place. I won the raffle for Vic’s demonstration carving (image left) by being the very last name drawn from the bowl, “the biggest loser wins”. The irony of the only student to carve a female bust winning the male demonstration bust was noted by many. I won the piece, by losing, fair and square. The female bust will wait in queue with several other half completed projects. Perhaps she will persuade me to cut to the front of the line. This weekend I attended Ian Norbury’s Carve by Numbers class at American Woodcarving School in Wayne NJ, the first stop of Ian’s 2013 tour. Ian and his wife Betty are a delight. Ian is a gifted teacher and observing his carving expertise is a pleasure. His talent is obvious and Ian shares his knowledge unprotected and with cheerful enthusiasm. It is a surreal retreat to set aside three full days to carve beside a legend. It’s not often I have the time or the energy to focus on nonstop carving. 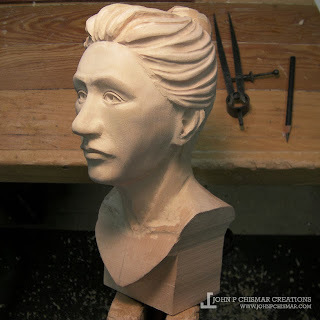 At the end of the weekend I nearly completed my Female Head and returned home inspired and driven to carve more. Both Ian and Betty are warm, welcome and a lot of fun. I hope our paths will cross again someday. A time-lapse video of me carving this piece is available on my site.